Hi everyone! 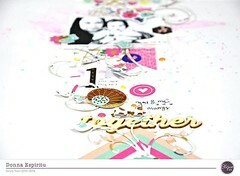 It’s Heather Doolittle here today to share my first project I have made with the June Aquarelle scrapbook kit! I’m a guest designer this month, and I have had a lot of fun playing with this absolutely GORGEOUS kit. This Wild at Heart collection by Cocoa Vanilla Studio is so pretty, and all of the embellishments in this kit are amazing. Hi! My name is Heather Doolittle (formerly Heather Adams) and I am a 22-year-old graphic designer from the beautiful state of West Virginia. I have been scrapbooking since 2009— my mom had bought some scrapbook supplies for my birthday a few years prior and I just decided to use them one day. I’ve been hooked ever since! It’s crazy how happy pretty paper can make me. Besides crafting, I love traveling with my handsome hubby (we travel for his work), spending time with our families, and trying new things here and there- like scuba diving! My husband is a very adventurous person, so who knows what I will do in my lifetime! As a graphic designer, I have recently had the pleasure of creating collections for Pretty Little Studio. It’s so much fun seeing my designs out in the “wild”! I am so happy to be guest designing for Clique Kits this month! So this is the first layout that I made upon receiving the Aquarelle kit. At first, it’s all so pretty you almost don’t know what to use first! I chose the Fussy Cuts paper and cut out several of the elements from that page. Then I started arranging everything on my 8.5×11″ page. I usually use white cardstock for my backgrounds, so I thought this time I’d add a little bit of mixed media to the plain paper. Using my Gansai Tambi watercolors, I painted a big swash of coral on the background, adding some splatters at the last. After the paint dried, I put the pieces back on the page (There’s SO many adorable, love-y phrases in the Wild at Heart collection– wish I could have used them all!) and finished embellishing with a diecut and rubber phrase arrow from the kit. I thought about machine stitching on some of the pieces, but I changed my mind and left it as is. Instead, I added some tiny attacher staples for texture. I used foam adhesive to glue down the heart, butterfly, and flower. That way there’s some dimension to the page! Thanks for stopping by, and I can’t wait to share my next project with you soon! What a pretty page, I love using the watercolor to be the cornerstone for your page.